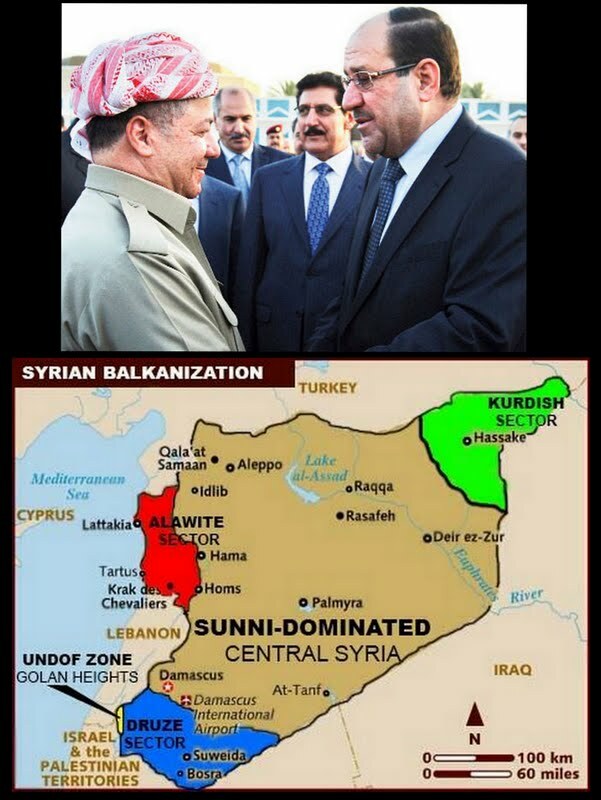 The specter of Syria’s balkanization has yet to pass from sight. Tehran has now given the thumbs up for a “provisional civil administration” in Syria’s Kurdish areas and agreed to help clear out Qaeda-linked extremists there. Western Kurdistan refers to the Kurdish areas in northern and northeastern Syria bordering Turkey. Muslim also tells pan-Arab al-Hayat today agreement was reached with the Iranian side “to fight our common enemy,” chiefly Jabhat al-Nusra and the Islamic State of Iraq and the Levant. Muslim said he met with high-ranking foreign ministry and Revolutionary Guards officials during his August 7-8 stay in Tehran at the invitation of the foreign ministry. “Iran is an important country. It is the only one in the region to have the ear of the [Syrian] regime,” he said. For a while now, the print media and a number of political and media centers have been saying terrorists in Western Kurdistan have mobilized against Kurdish citizens and that Qaeda-linked terrorists are attacking innocent civilians and massacring Kurdish women and children. To verify such news, I am calling for a special inquiry commission to travel to Western Kurdistan and investigate. If it finds that innocent Kurdish citizens, women and children are under threat of death and terrorism, the Iraqi Kurdistan Region will make use of all its capabilities to defend innocent Kurdish women, children and citizens in Western Kurdistan. Spread over large, adjoining tracts of Iraq, Syria, Turkey and Iran, the Kurdish people are often described as the largest ethnic group without their own state. The northern Iraqi region of Kurdistan, which has its own government and armed forces, is pursuing increasingly independent energy and foreign policies, infuriating Baghdad. Iraqi Kurds have sent fuel, food and medical aid to their ethnic kin over the border in Syria, extending Barzani’s influence, but Saturday’s statement appeared to be the first time that he had suggested intervention. In Syria, where they make up nearly 10 percent of the population, Kurds have been widely discriminated against under Bashar al-Assad and his late father before him, who stripped more than 100,000 of their citizenship. For Syrian Kurds, the insurrection against Assad presents an opportunity to win the kind of rights enjoyed by their neighbors in Iraqi Kurdistan. Quoting from Kuwait’s al-Seyassah newspaper, Baghdad’s Shafaq News reported August 9, “Iraqi Prime Minister Nouri al-Maliki notified KRG President Masoud Barzani that the Assad regime is not against Peshmerga forces entering northern Syria to defend Syrian Kurds against attacks by al-Qaeda. All this highlights the potential for Peshmerga, Syrian Kurd, Iranian and Iraqi forces banding together to help Assad win his presumed war on Takfiris, Jihadists and al-Qaeda -- at least in Western Kurdistan. In his opinion, Syria’s Kurds are bent on carving out an autonomous enclave in northeastern Syria. This reminds me of the presentation former Secretary of State Henry Kissinger made at the Ford School in New York City last June, when he said a Balkanized Syria is the best outcome to emerge of its current Assad-controlled unity. “There are three possible outcomes. An Assad victory, a Sunni victory, or an outcome in which the various nationalities agree to co-exist together but in more or less autonomous regions, so that they can’t oppress each other. That’s the outcome I would prefer to see. But that’s not the popular view,” he said. Are Assad’s allies heeding Kissinger’s counsel and pushing Barzani and Syria’s Kurds to go down that route?